I’m pleased to report another finish. This time it’s the Hundred Hugs Quilt. I made the top a few years ago and finally quilted and bound it in the last few weeks. I love that it’s scrappy yet has a controlled colourway of green and blue. The quilt is a bit crinkly but has been washed and soft and clean and is ready to be gifted. I’ve decided I’m keeping this one so that I have a baby boy quilt on hand. I don’t have anyone in mind for it but I’m sure the opportunity to gift this will come up sooner rather than later. This makes 2 of the 5 quilts I recently quilted completely finished. The hand sewing of the binding is coming along on another 2 quilts and the binding has been chosen but not yet sewed for the last of the 5 quilts. I’m slowly getting there with finishes. I’d love to get them all finished by the end of the month. I’m linking this up with many of the blogs on my Quilt Link Up Parties page. So bright and cheery! Some lucky little fellow will love it. This is such a bright, happy quilt! Love the sawtooth border. Thanks for linking up to TGIFF! Thank you for hosting such fun link-up! It is a bright and fun quilt! I love the blue/green combination! Thank you so much! I am very pleased with it. What a fun quilt. Congratulations on the finish. That always feels good. It feels very good to move things from the “to do” to the finished pile. Finishes feel sooooo good! Love it! I can see doing several in different colour combos, like your blue/green or pink/purple. Thank you. I think the colour combinations this could be done in are endless but now you have me thinking of making it in pink and purple. That would be gorgeous! That is just beautiful! I love all the color in it! I do love Deanna’s designs, and it looks like you do, too. That is one of my favorites to have waiting for a new baby. Yours looks great in that bright mix of fabrics! Deanna’s designs are the best. I have made more than one or two of her quilts and they all go together and look fabulous! Good patterns equal good results! What a beautiful little quilt! I be love scrappy! Some lucky little boy is going to get this one. Thanks for sharing it on Wednesday Wait Loss. Yes those colors make it so yummy!! I have never seen this pattern before, had to go on a hunt-she has great tutorials! Thanks for sharing. 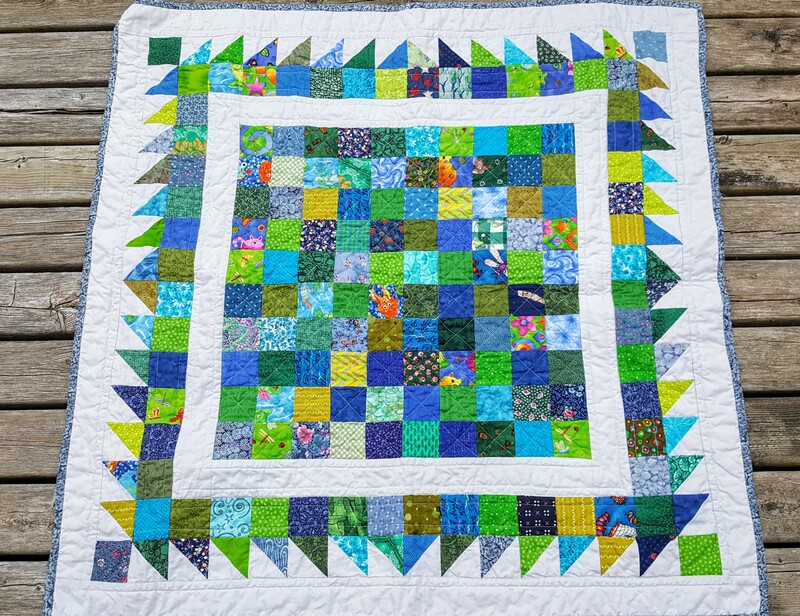 Blue/green is my favorite color combo, and it looks so cheerful in your quilt! It will make a wonderful gift. Good luck in reaching your binding goal this month. :). Thanks for sharing your quilt on Main Crush Monday!